A country of significant religious orientation and possessing one-fourth of the world's oil reserves, Saudi Arabia ( Al Arabiyah as Suudiyah ) wields substantial political influence. As one of the Gulf States, it is bordered to the north by Jordan, Iraq, and Kuwait, to the south by Yemen and Qatar, and to the southeast by the UAE, Bahrain, and Qatar. At 850,000 square miles it is the largest political actor in the Gulf Region, taking up more than two-thirds of the Arabian Peninsula and besting the next largest state of the region—Iran—by roughly 200,000 square miles. In fact, all of the land area of its bordering neighbors when added together only amounts to approximately 516,000 square miles. Though land alone is not always an indicator of political influence, in this case it does correlate due in large part to the oil reserves it has bequeathed to the country. For Saudi Arabia, oil is the most valuable natural resource it possesses; actually, it is one of the few it possesses. Never colonized or wholly dominated by an outside power, the Saudis in large part have their bleak landscape and harsh climate to thank for this detail. There are no rivers, lakes, or forests in the country and only intermittent streams ever flow and only in certain areas. Less than 1 percent of its land is agriculturally viable for any crop with most of the actual surface area being either rock, gravel, or sand. The limited agriculture that does occur is in the Western mountainous Hijaz province where, with some of the peaks reaching 10,000 feet, enough precipitation falls. In other areas enough scrub brush survives to be used for grazing, but even this is only for about one-third of the land area. Along with the Hijaz, the middle Najd province and the eastern Hasa province are habitable, but in the south, there is a region known as the Rub'al-Khali or the "Empty Quarter." This area is rainless and hosts the largest area of sand in the world, dunes that can be several hundred feet tall, and a blistering desert wind that eternally shifts it all about. It is uninhabited even by nomadic tribes. While Saudi Arabia has had a long and colorful history, including being the birthplace of Islam, the origins of the current Kingdom of Saudi Arabia began around 1902 when an exiled 22-year-old Abd al-Aziz ibn Abd ar-Rahman, who later became Abd al-Aziz Al-Saud (also written Abdul Aziz ibn Saud or Abdul Aziz Al-Sa'ud), launched a daring rescue of his family's former holdings that had been captured by the Rashid family in 1890. With only about 200 men he captured the walled city of Riyadh and began to restore the power of the House of Sa'ud. The Sa'ud family, as well as historically holding political influence in the area, also popularized the particular sense of Sunni Islam known as the Wahhabi movement currently prevalent in Saudi Arabia. Wahhabism had its beginnings in the seventeenth century when Muhamad ibn Saud—leader of a tribe in the Najd— accepted the teachings of Muhammad ibn Abd al-Wahhab. After capturing Riyadh, Abd al-Aziz greatly expanded his territory over the next 30 years, including incorporating the all-important Mecca and Medina into his realm. In addition, he consolidated enough power preceding and during World War I (paid $25,000 a year by the British not to side with Turkey) that by September 23, 1932, the Kingdom Saudi Arabia ( Al Mamlakah al Arabiyah as Suudiyah ) was proclaimed under his rule. He ruled until his death in 1953. Abd al-Aziz was succeeded by his son Saud who ruled through 1964. However, during portions of this time his brother Prince Faisal actually ran government affairs. After a power struggle, Faisal was made King on November 2, 1964. Faisal was a firm supporter of the Palestinians in their struggle against Israel, a critic of communism for any Arab country, often at odds with Egypt over policy, and happened to put the events in motion that created the United States' oil crisis in the 1970s. He was shot and killed by a nephew in 1975. Faisal's brother Khalid was then proclaimed King. Khalid ruled until his death in 1982. Khalid's principle aide and brother, Fahd, succeeded him as King. King Fahd Bin-Abd-al-Aziz Al Sa'ud is a son of the country's original founder and in addition to being King, in 1986 also declared himself "Custodian of the Two Holy Mosques" to affirm his commitment to Islam. While Fahd remains King after suffering a number of strokes in 1995 his brother, Prince Abdullah, has been the active ruler. As of 2001, Saudi Arabia had a population of more than 22 million people with an average annual income of about eight thousand dollars. The capital Riyadh (population 4.3 million) lies in the Najd province. Other important cities include: Mecca (1.2 million), Medina, Jeddah (2.25 million), and Damman/Khobar/Dhahran (1.6 million). The country is 90 percent Arab and 10 percent Afro-Asian in ethnic composition. The official language is Arabic with English also taught in schools. In relation to religion it is almost 100 percent Islamic, the exception being expatriate workers. The country is governed according to traditional Islamic law called Shari'a and also by a set of Basic Laws introduced in 1993 delineating the government's rights and responsibilities. There is no suffrage in the country. Saudi Arabia is a hereditary monarchy where the King is both the chief of state and the head of government and the crown prince is deputy of both state and government. There are also both a Council of Ministers and a Supreme Council of Justice. There are no political pressure groups and political parties are not allowed. In 1908, the country's first newspaper— al Hijaz —appeared. Up to World War II a few other papers appeared, including Umm al Qura , the official government journal, Sawt al Hijaz , and Madinah al Manawarah . These were shut down, except for Umm al Qura , during WWII due to lack of funding. Publication of these papers was resumed in the late 1940s from Jeddah; Madinah under the same name, and Sawt al Hijaz under the name of Bilad al Sa'udiyah . There are 13 dailies (approximately one major daily is allowed per region) being published in both English and Arabic with Ar-Riyadh , Al-Jazirah , and Riyadh Daily being among the leading papers. As well, Sharq Al Awsat ( The Middle East ) is a leading Arabic daily and magazine in the region—started in 1978 and published in London under the ownership of Saudi Research and Publishing Company (SRPC), a firm under the umbrella company of Saudi Research and Marketing Group, SRMG). There are approximately 200 non-dailies being published. The overall average circulation for the country is listed as around 59 per 1,000 people. However, because there is no independent audit bureau of circulation in the country, circulation figures are at best estimates with reported figures sometimes fluctuating dramatically form source to source. A good example of this can be seen with the daily, Arab News . The reported circulation figures for this fluctuate between 51,481 and 110,000. The dailies typically available include (estimated circulation figures presented when available; defaulting to recency of report first and secondly to the lowest reported figures): Arab News (circ. 51,481; editor-in-chief, Khaled Al-Maeena), Al-Bilad ( The Country ; circ. 60,200; editor-in-chief, Abdulmajid Al-Shubukshi), Al-Eqtisadiah (circ. 76,928; editor, B. Oweida), Al-Hayat (circ. 168,250; editor, Omar Jastaniyah), Al-Jazirah ( The Peninsula ; circ. 93,000; ed-in-Chief, Mohammed bin Abbas), Al-Madina al-Munawara ( Medina — The Enlightened City ; circ. 46,370; editor-in-chief, Usama As-Siba'ie), Al-Watan , An-Nadwah ( The Council ; circ. 35,000; editor, Mohamed Algaddadi), Okaz (circ. 107,614; editor-in-chief, Khalid Darraj), Al-Riyadh (circ. 91,000; editor-in-chief, Turki A. As-Sudari), Riyadh Daily (circ. 91,000; editor-in-chief, Talaat Wafa), Saudi Gazette (circ. 60,000; editor-in-chief, Dr. Ahmad Al-Youssuf), URDU News (circ. 54,712; editor, B. Oweida), Al-Yaum ( Today ; circ. 34,000; editor-in-chief, Mohammed Al Waeel). ( The Muslims ; circ. 68,665, ed-in-chief, Dr. Abdullah Ar-Rifa'e), Saudi Arabia Business Week , Saudi Economic Survey (circ. 2,500; general manager, Walid S. Ashour), Sayidati ( My Lady ; editor-in-chief, Mataral-Ahmadi), and Al-Yamama (circ. 35,000; editor-in-chief, Abdullah Al-Jahlan). A range of other periodicals are published including: Ahlan Wasahlan ( Welcome ), Majallat al-Iqtisad wal-Idara ( Journal of Economics and Administration ), Saudi Review , As-Soqoor ( Falcons ), At-Tadhamon al-Islami ( Islamic Solidarity ), and At-Tijarah ( Commerce ). The topical range of Saudi press has increased considerably in recent years. In large part this is due to an increasing reader base that is the result of an expanding growth in literacy in the country. Literacy figures fluctuate like the circulation figures, but the highest available current statistics suggest 87.9 percent of males and 74.2 percent of females are literate. Compared with an early 1980s estimate of a 15 percent overall literacy rate the logic behind the expansion in print becomes readily apparent. Traditionally, any available positive or general affairs having to do with the royal family are always presented in every newspaper after it is sent to the them by the Saudi Press Agency (SPA), owned by the government. Other than this, newspapers vary in focus along the lines of politics, religion, editorializing, consumer information, local/national/international news emphases, economics, and the like. However, the Ministry of Information does provide guidelines on some issues for the papers to follow. The press in Saudi Arabia is privately owned. However, a number of organizations either have close connections with the royal family or actually have various members of the royal family involved in operations. There are approximately 12 publishing companies that control much of the publishing in the country's dailies, weeklies, and others. While there is some variety due to the number of publishing companies, some of the companies publish multiple titles potentially lessening the overall variety due to similarity in influence. For instance, Saudi Research and Publishing Company oversees the publishing of 17 titles including five of the 13 dailies. Dailies are typically published Saturday-Thursday (Friday being held sacred by Muslims). Advertising is allowed in publications and this helps to subsidize the cost of production lessening the public's price of newsprint, which is almost all imported. There is a 1964 press code that gives the government the right to interfere with the press when it feels the general welfare is threatened such as with criticism of Islam, the royal family, or the government. In such cases, publishing of the paper can be curtailed. This is supposed to happen nadiran (rarely). Also included in this code is the right of the Ministry of Information to veto any candidate in any company up for the board of directors. The Ministry also appoints the editor-in-chief and the chairman-ofthe-board in all companies from among candidates chosen by each board. It also has the power to dismiss those chosen for these positions. Also, despite privatization of ownership for printing and publishing houses, all such organizations are required to be licensed by the Ministry of Information. The terms for licensure include having at least 15 Saudis involved, being headed by a director general, and having at least one hundred thousand Saudi riyals (SAR) available. Licenses can be revoked arbitrarily at any time. In theory, Saudi Arabia's privately owned publishing companies enjoy relative freedom of expression in the press. However, for all practical purposes they are essentially official newspapers. The press is closely scrutinized by the Director General of Broadcasting, Press and Publications and can be censored on any significant topic or sensitive issue that does not meet with government approval. Additionally, a 1982 royal decree requires journalists to adhere to stringent self-censorship specifically dealing with foreign or national heads of state. While the tendency is for the government to deal quietly with issues of concern, sentencing can be quick and extreme. Also, the press and other media are owned by people who have interests based in maintaining the status quo for economic and political reasons—due especially to the way in which they are licensed and chosen by the government—and therefore are unlikely to go against government desires in general. A further portion of the problem is that press freedom violations are typically not reported to reporting agencies for fear of further repercussions and therefore the extent of the problem remains unknown. Overall, while there is legal freedom of the press there is significant censorship occurring—whether it is self or government imposed. Yet, compared to a decade ago press freedom seems to be increasing except for recent setbacks such as the editor of Al-Madina being deposed on March 18, 2002, after publishing a critical poem by a famous Saudi poet critiquing Saudi judges (the poet was imprisoned on March 16, 2002) and a revocation on March 22, 2002, of a royal decree a year earlier that had allowed Al-Hayat to be distributed without censorship. As per above, as long as the press remains within the broad guidelines set out by the government there is a cordial relationship between the two. Of course, there is no question of who has the final authority in matters as from time to time harsh sentences are laid upon journalists and/ or publishers who fail to follow guidelines. Foreign journalists have a difficult time in Saudi Arabia. There is considerable restriction of movement and information available. Visas are hard to come by and are stringently monitored along with the content they are producing for publication. Journalists walk a fine line in Saudi Arabia between being able to be ethically true to their convictions and being able to stay in the country. Foreign media is available, but it is screened upon entry to the country before being released to the Saudi public. Much of the negative attitude toward the foreign press, especially of Western press, is that it is unethical. It often violates aspects of Islam which the Saudi government and Saudi Imams find offensive. Political content is also censored, but it often times need not even get to that point due to advertising that becomes the immediate negative. The Saudi Press Agency (SPA), established in 1971 and owned by the government, is solely responsible for the creation of official news. This is then forwarded to all national papers for inclusion in their publications. Radio has historically been an important fixture. King Saud introduced radio into the country under duress from the Wahhabi ulema (Islamic theologians). He circumvented their arguments against it by replying, "Can anything be bad which transmits the word of God?" Today there are 43 AM, 31 FM, and 2 short-wave broadcast stations in the country broadcasting to 6.25 million radios in approximately 43 languages. For all of the stations available, there is one state-owned service—Saudi Arabian Broadcasting Service—and one privately owned radio service—Saudi ARAMCO FM Radio, with the private service available to employees of Saudi Arabian American Oil Company (ARAMCO). under the rubric the Desert Shield Network, to broadcast programming from "back home." Much of this programming arrived via satellite from Armed Forces Radio and Television Service (AFRTS) based in Los Angeles. Broadcast service for stationed American personnel continues to operate and provides an interesting variation from the usual local programming and other short-wave programming such as the BBC and VOA. One other relatively recent phenomenon is MBCFM. It is an Saudi-owned, Arabic language service broadcast from London, relayed by satellite to major Saudi cities, and rebroadcast on local FM stations. Its programming provides music, news, and talk shows. It is the only private radio station permitted; this is due to the fact that it is owned by Sheikh Walid Al Ibrahim, brother-in-law of King Fahd. First suggested in 1963 and becoming a reality July 15, 1965, television broadcasting is also a state-run affair overseen by the Ministry of Information, funded by the government and advertising revenue (advertising was allowed as of 1986), and broadcast by Saudi Arabian Government Television Service (Arabic) and Saudi Arabian Government Television Service Channel 2 (English with a news bulletin in French). However, as with radio, ARAMCO Oil Company runs one private service—Dahran HZ-22-TV or ARAMCO TV. Overall there are 117 broadcast stations broadcasting to 5.1 million television sets. Television is strenuously censored, especially as concerns the portrayal of women. The portrayal of women in media is an extremely sensitive issue due to the Islam opinion of the role of women. Working against the censorship of the national television network is the availability of satellite broadcasts that are easily accessible. Satellite dishes are officially banned in the kingdom, but the government rarely enforces the ban. Qatar-based Al-Jazeera provides the most popular satellite programming. Through close surveillance by a department of the King Abdul Aziz City for Science and Technology (KASCT), Saudi Arabia maintains strict control over the Internet, censoring any content deemed offensive to Islam or to the government. As an example of the govern-ment's control, in February 2002, the government shut down over 400 sites without providing explanation. Be that as it may, a number of traditional press publications, publishers, radio stations, and even TV stations maintain a presence on the Internet. 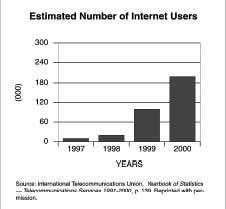 As of 2001 there were 400,000 Internet users and 42 Internet service providers (ISPs). Until 1999, there was no Internet public access in Saudi Arabia; use was limited to universities and some public operations. From no public access to 400,000 users in three years is suggestive of the remarkable electronic revolution occurring in the country. As well, unauthorized Internet access is available through Bahrain and the UAE and a purported 26,000 take advantage of this. Of all Internet users, an unofficial estimate is that two-thirds are women (suggested as being related to their restriction of movement). While ongoing utilization of new technologies continues to open pathways into a traditionally closed society, Saudi Arabia remains resistant to many aspects relating to freedom of the press and to recognition of human rights. Yet, Saudi citizens have access to a fuller repertoire of information than ever before and Saudi government has less control over information flows than they ever have. It remains to be seen how or if this will translate into the creation of a more robust civil society with fuller freedoms for the press, for the media, and for all Saudi citizens. February 2002: Saudi government closes 400 Internet sites without explanation. March 2002: Mohammed al-Mukhtar, editor-in-chief of the daily paper Al-Madina dismissed by interior minister Prince Nayef, after printing a poem about judicial corruption. Abdul Mohsen Musalam, the poet, was jailed on March 16 for the offense. March 2002: information minister Fuad al-Farsi orders the pre-distribution censorship of the pan-Arab daily paper Al-Hayat , revoking a royal decree issued a year earlier allowing it to be distributed without censorship. All the World's Newspapers . Available from www.webwombat.com.au/ . Atalpedia Online. Country Index . Available from http:// www.atlapedia.com/ . British Broadcast Company. BBC News Country Profiles . Available: http://news.bbc.co.uk/ . Boyd, Douglas. Broadcasting in the Arab World: A Survey of the Electronic Media in the Middle East , 3rd ed. Ames, IA: Iowa State University Press, 1999. Central Intelligence Agency. The World Factbook 2001 . Available from http://www.cia.gov/cia/ . International Press Institute. World Press Review . Available from http://www.freemedia.at/ . Jerichow, Anders. The Saudi File: People, Power, and Politics . Richmond, VA: Curzon Press Ltd., 1998. Kurian, George, ed. World Press Encyclopedia . New York: Facts on File, Inc., 1982. Library of Congress. Country Studies . Available from http://lcweb2.loc.gov/frd/cs/ . Maher, Joanne, ed. Regional Surveys of the World: The Middle East and North Africa 2002 , 48th ed. London: Europa Publications, 2001. Redmon, Clare, ed. Willings Press Guide 2002 , Vol. 2. Chesham, Bucks., UK: Waymaker Ltd., 2002. Reporters Sans Frontieres. Saudi Arabia Annual Report 2002 . Available from http://www.rsf.fr . Russell, Malcom. The Middle East and South Asia 2001 , 35th ed. Harpers Ferry, WV: United Book Press, Inc.,2001. Saudi Arabian Information Resource. Available from http://saudinf.com . Saudi Arabian Oil Company (ARAMCO).Available from http://www.saudiARAMCO.com . Saudi Press Agency. Available from http://www.spa.gov.sa/html/ . Saudi Public Relations Company (SPRC). Available from http://www.arab.net . Stat-USA. International Trade Library: Country Background Notes . Available from http://ww.stat-usa.gov . Sumner, Jeff, ed. Gale Directory of Publications and Broadcast Media , Vol. 5, 136th ed. Farmington Hills, MI: Gale Group, 2002. The Gulf/2000 Project. Available from http://ulf2000.columbia.edu . The Middle East , 9th ed. Washington, DC: Congressional Quarterly Inc., 2000. Vassiliev, Alexei. The History of Saudi Arabia . New York: New York University Press, 2000. World Bank. Data and Statistics . Available from http://www.worldbank.org . World Desk Reference. Available from http://www.travel.dk.com/wdr/ . Yamani, Mai. Changed Identities: The Challenge of a New Generation in Saudi Arabia . London: Royal Institute of National Affairs, 1999. Is thi information updated. How old is it & is it reliable information. it is well informtion for visitors.i get very broad information from here.so i appreciate to u and plz send me infortiom about saudia media and trade. Hi sir/madam,i wish to extend greetings to you all in the office.i have been a kind listerner to your programmes through short wave and i will want some of your latest handouts,magazin,t-shirt pen and books.